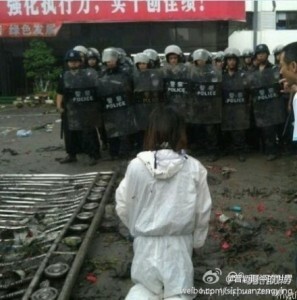 A protester kneels in front of oncoming riot police during the Shifang demonstrations against a copper refinery. By Shi Fengrong, via Tea Leaf Nation. Before last Monday, Shifang, a city in southwestern China, was mostly known to outsiders as the producer of handmade cigars enjoyed by Mao Zedong and other top Communist leaders. After Monday, the city’s more traditional reputation was quickly eclipsed by a new one for the 21st century: It became the site of a massive grassroots protest aided by Chinese social media like Weibo, an equivalent to Twitter. Thousands took to the streets two days later, gathering in the public square and in front of government buildings throughout Sunday evening to express their concern over the chemicals that would be produced by the plant. On Monday, local riot police were ordered to move in and were caught on film and video doing their job: turning tear gas and batons against defiant participants, some of whom reportedly grew disorderly in response. The police returned again the next day, and continued their attempts to disperse the growing crowds. However, in what is now becoming a familiar narrative in China, pressure from on-the-ground protesters — combined with the millions more virtual ones online who shared and commented on the photos and videos flowing out of Shifang — forced the central government to intervene. The environment is a particularly good example of an issue that local protesters have been able to successfully rally around without facing severe punishments — so long as their case isn’t first snuffed out by local officials or companies and their security forces. Thus, Weibo and other social media are of paramount importance in cases like Shifang and Wukan. As word of the Shifang clash began circulating online on Monday, Shifang (什邡) became the most searched-for term on Weibo, and though there were the inevitable attempts to censor the posting of messages about Shifang and searches for the term, 什邡 for the most part remained unblocked, perhaps a sign that central government leaders recognized that the local officials were a convenient scapegoat. An essay by China’s enfant terrible, blogger and race car driver Han Han, only fueled the lively conversation online. Soon, it was clear that the balance had been tipped in the protesters’ favor. It is in such circumstances that local governments should earnestly deal with every single industrial project that carries environmental concerns. They should tell the truth to the public, rather than harbor the illusion that public opinion can be controlled when it comes to environmental issues. On Thursday, the vilified top official in Shifang was officially punished with a demotion, and a new party secretary was announced as his replacement, a mere four days after the start of the protests. This was a decided victory for what had begun as a seemingly simple “not in my backyard” protest but eventually became a symbol for China’s complex balancing act between economic growth and environmental concerns, as well as another positive sign that Chinese leadership is becoming more responsive to local concerns — so long as the story makes it to Weibo. Time will tell, however, whether the refinery project has been permanently cancelled or whether it will be re-started once the furor dies down, as has apparently happened in other cities. Proud of the Chinese standing up to do what is right. These are powerful imagery of what is really happening in their country and seeing people who stand up against what is deemed wrong gives us witnesses the motivation to fight our own battles.